First of all... every Cleveland fan should be thanking me for calling out Donyell. He obviously read my blog and came out on a mission. Secondly... that Yahoo article or whatever you call it was idiotic. "Retarded Chameleons"... oh the hilarity. Granted Lebron was a little slow out of the gate this year, but after the all-star break he was back. So to say he was indifferent since November is just another example of how people don't even know what they're writing about. Pucky... yes Damon Jones fouled Kidd once (it was more of a Lou Thesz Press than a Rock Bottom) but I doubt that was the strategy in putting him in the game. I doubt Damon Jones was the assigned thug of the night. That being said, he did make very sound passes and good decisions and played decent defense. Most importantly, he kept the Nets honest (which I don't understand considering he hasn't taken a shot in two months). Damon Jones deserves some playing time. I was screaming for Mike Brown's job during that Nets run because of how pathetic our offense is without Lebron. How about calling time out and setting up an easy look for either Z or Gooden... something high percentage since your main offensive weapon is out. That's what good coaches do. I got so loud, the wife told me to leave (the kid was trying to go to sleep). I countered with "The kid can sleep anytime! This is a disaster!". Not really, I just tried to scream more under my breathe. Anyway, last night wore me out physically, emotionally, and mentally. 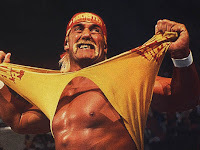 It was like an epic Hulk Hogan wrestling match ... Hogan comes out like gang busters.... the heel counters and has Hogan on the ropes.... Hogan Hulks up, waves the "no" finger, and delivers the big boot/legdrop combo...match over... Hogan wins! And I'm spent. Every... and I mean EVERY... NBA analyst (there are you happy Pucky) I heard on ESPN and Mike & Mike, said after Game 5 that the Nets were going to win or they wouldn't be surprised if the Nets win... you can go shove it up your asses. Cavs-Jazz Finals? If it happens we should make Boozer's stay in Cleveland a living hell. Props to Austin Carr and his "Jesus!" call when the Nets cut it to 1.